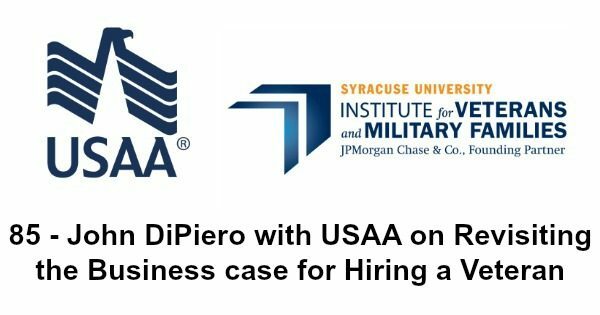 In this episode of Fire and Adjust, I invited John DiPiero, Military Advocacy Relationship Director at USAA to talk about the second paper in the employment research series called the “Workforce Readiness Research,” a project collaboration between the Institute for Veterans and Military Families (IVMF) and USAA. In the first part of our conversation we talked about John’s own story. John spent 29 years in the Air Force and said that when he went out he didn’t know what exactly to do. When I asked how his transition was, he said it was a quick decision. He made some mistakes along the way. John’s first job out of service was at a military school as teacher. He said that his two years there was seminal in his gradual transition into the civilian world. His next job was in Military Affairs at USAA, another role that felt comfortable and made his transition even less difficult than some vets undergo. His real challenge though came when he was transferred to the HR team where he had to learn and adapt into a very new environment that challenged his comfort zone. In the second part of our conversation, John introduced the second paper in the Workforce Readiness Research which was entitled “Revisiting the Business Case for Hiring a Veteran: A Strategy for Cultivating Competitive Advantage.” The paper responds to recent focus and debate on measuring companies’ return on investment for their veteran hiring programs, and emphasizes how employers can turn veteran talent into a competitive advantage in talent acquisition, talent deployment and talent development. Listen to the podcast episode to learn more about John and how employers can help veterans and benefit from doing so as derived from the findings of the second paper.